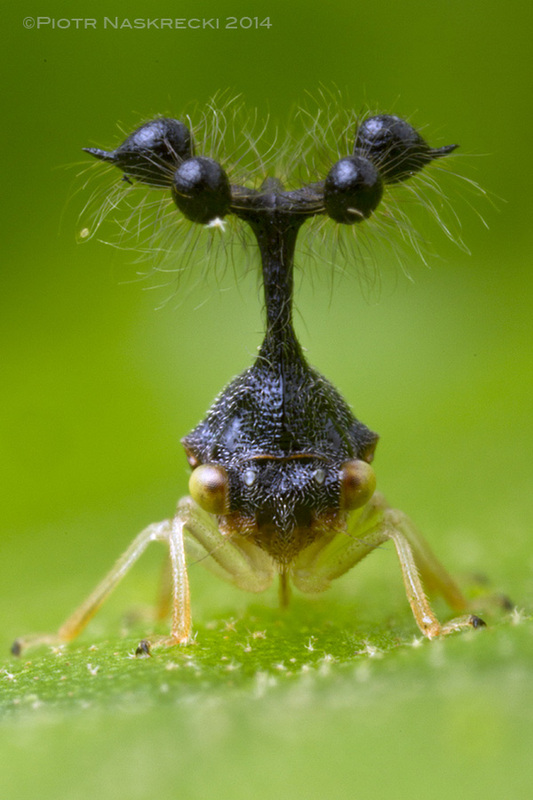 Nobody really knows what the strange structures on the head of the Bocydium treehopper are for. They don’t use them in courtship and seem pretty ineffective for defense. “I need to have my vision checked” was the first thought that popped into my head when my eyes met a treehopper of the genus Bocydium sitting on a thin branch in the Braulio Carillo National Park in Costa Rica, where I was researching several newly discovered katydid species. I had seen many mind-boggling organisms during my years as a tropical entomologist, but this thing looked like something that had just disembarked from a tiny interstellar spaceship. All the parts expected of a self-respecting insect were there – six legs, compound eyes, two pairs of wings – but what was the deal with the huge modernist sculpture on the head? For ants, a colony of treehoppers is like a pasture full of cattle. They protect the insects and collect their nutritious honeydew. An ant can elicit the production of a droplet of honeydew by gently stroking a treehopper (in this case a Costa Rican Harmonides sp.) with her antennae. Treehoppers, members of the family Membracidae, are distant relatives of cicadas and aphids, and just like them they feed on liquids that flow through vascular tissues of plants. Such diet is extremely rich in carbohydrates, to the point that the excess must be expelled by the treehoppers. They do so in the form of honeydew, sugary water, dripping off the end of their abdomen, a substance that other organisms, ants mostly, find both delectable and worthy of fighting for. For this reason ants frequently form mutualistic relationships with treehopers, and defend them against potential predators in exchange for nutritious droplets. Some ants are even capable of asking for honeydew by gently tapping or stroking the treehopper’s abdomen, to which the insect responds by dispensing the drink. In addition to ants, certain wasps and flies also take advantage of this resource, but do not seem to repay in any way. 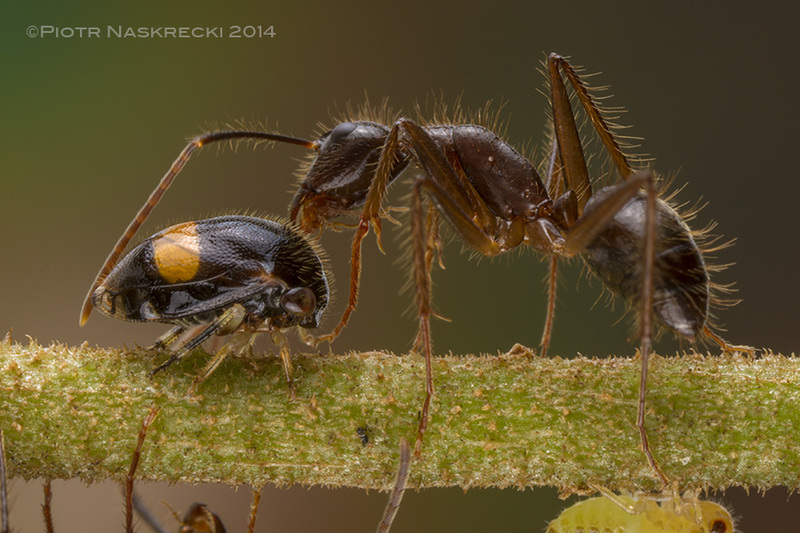 This mutualistic relationship with ants can influence the maternal behavior of some species. In many treehoppers the female guards the eggs and newly hatched brood, shielding them with her body and fending off predators. But if ants are constantly present, assuming the role of the brood’s guardians, then there is no need for her to stick around and protect her children. Instead, she can move on and lay another clutch of eggs on a different part of the host plant. 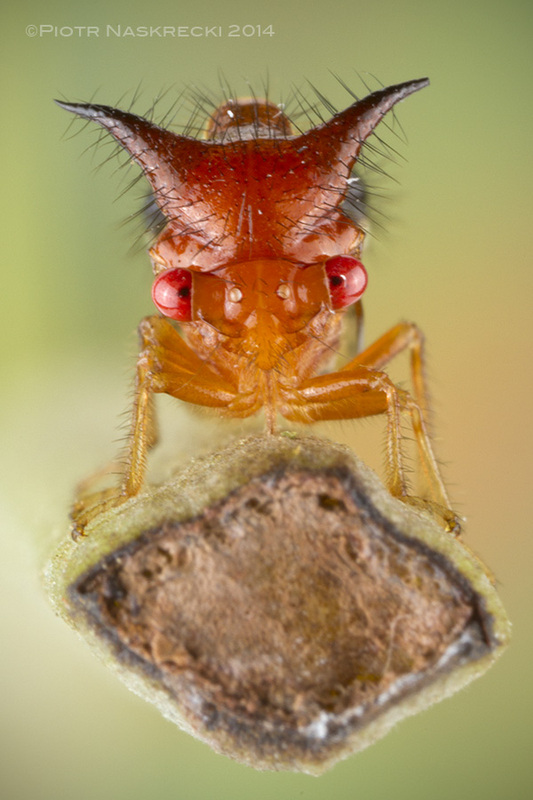 Treehopper species that lead solitary life and don’t display maternal guarding of the brood are unlikely to attract ants’ protective interest as it is simply uneconomical for the ants to travel long distances to collect honeydew from a single insect. Thus, in some cases, developing nymphs of solitary species join “herds” of communal treehoppers, thus gaining the benefit of ants’ services. Treehoppers are excellent parents – this female Thorn treehopper (Umbonia sp.) is shielding her eggs with her body; if necessary she can also use her powerful legs to kick and ward off potential predators. But treehoppers are by no means helpless and, in the absence of ants, can defend themselves quite effectively using deceit, amazing body armor, and kickboxing (or at least an insect version of it). 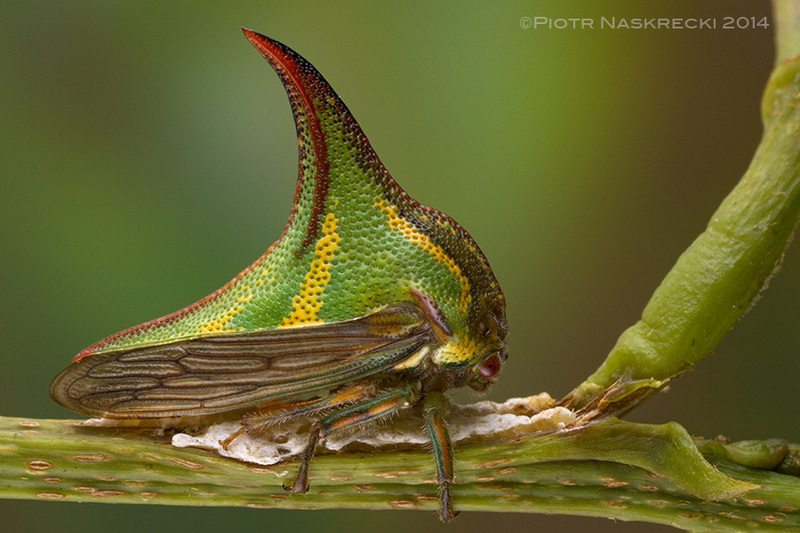 Nearly all species of treehoppers carry a massive, often intricately shaped and beautifully colored shield-like thoracic structure known as the helmet. In most cases its function is that of crypsis – many species resemble thorns, tiny leaves, or random bits of vegetation. Others use their helmet and bright coloration to turn into perfect replicas of stinging wasps, albeit they of course remain completely harmless. Members of the tribe Hoplophorionini, however, go beyond such passive defense and have evolved powerfully muscled, spiny legs, which they are not shy to use on a wasp or any other predator that makes a mistake of straying too close. They kick and flap their wings, which is usually enough to drive away a predator several times their size. In those species where the female guards a large group of children, who usually position themselves in a long line all along a branch of their favorite plant, the insects employ a complicated language of acoustic signals – the nymphs can “talk” to the mother by sending substrate-borne vibrations, alerting her to an approaching enemy so that she can come running and ward the predator off. Acoustic communication is also used among adults to find mates, stake territories, or warn others about predators. Some species eavesdrop on other treehoppers to look for richer or safer pastures. 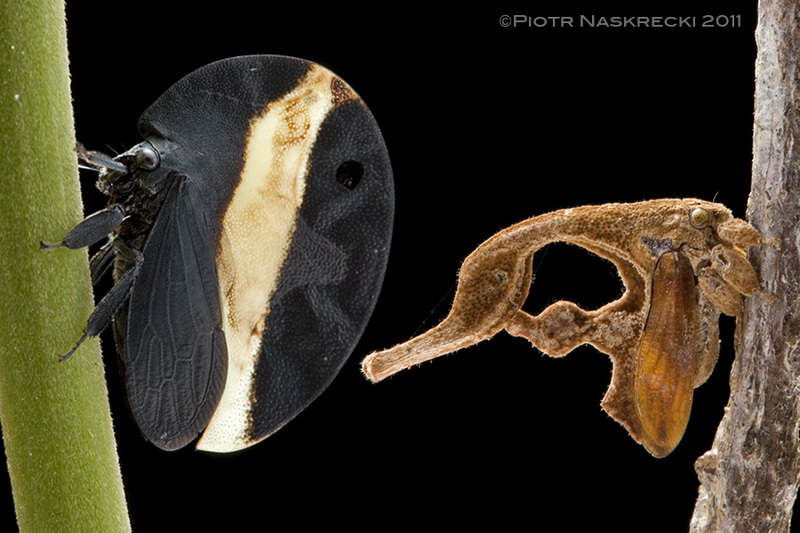 Two extreme examples of treehopper morphology – Membracis zonata, showing disruptive coloration that conceals the fact of being an insect, and Cladonota ridicula, a perfect imitator of a dead speck of vegetation. Entomologists had always assumed that trehoppers’ helmet was a simple outgrowth of the pronotum, or the dorsal plate of the first segment of the thorax. 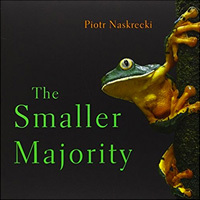 Pronotal modifications can be seen in other groups of insects (beetles or grasshoppers, for example), and thus it was only logical that treehoppers represented merely an extreme case of such a development. 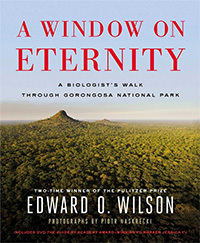 But a study published in 2011 by Benjamin Prud’homme and his colleagues (pdf) challenged this view. It provided tantalizing evidence that the awesome structures that treehoppers carry on their bodies are essentially a third pair of wings that had evolved to play a very different function. By carefully studying the embryonic development of treehoppers and mapping the expression of certain Hox genes (genes that control the development of serial structures, such as an insect’s body segments), they were able to show that the helmet of treehopers starts as a pair of tiny wing-like structures that later expand and fuse above the body. In some cases they even retain traces of hinges that are present at the base of normal insect wings. And thus we know how, but not necessarily why. Some entomologists have suggested that the otherworldly shapes of Bocydium and other insane treehoppers are examples of ant mimicry, or simply serve to turn the body of an otherwise helpless insect into an equivalent of unpalatable fishhooks. But there might be another explanation – what if these structures are sophisticated satellite antennas and the treehoppers use them to stay in touch with the mothership? Probably not. Or maybe? 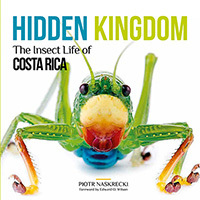 What possible function can these massive horns play in this Costa Rican treehopper Umbelligerus woldai? 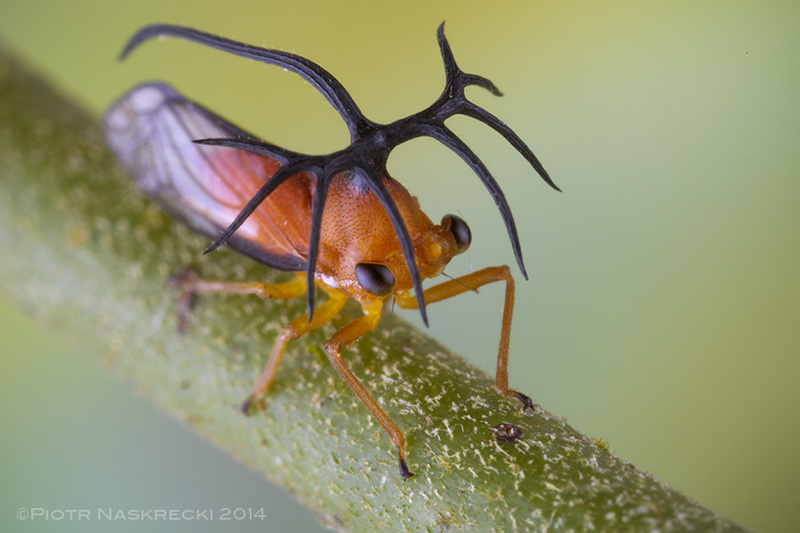 A portrait of a Costa Rican treehopper Poppea capricornis. Hi, I’m a student currently studying maternal defense behavior in Alchisme grossa, Antianthe expansa, and Umbonia crassicornis. I really liked your article, but I couldn’t find any sources on your webpage. Is there any way you could direct me to some of the primary literature that you used in this article? I would be very grateful! Keep up the good content. Most of the information in this post comes from Reg Crocroft’s work. The note about defensive behavior in Hoplophorionini comes from his paper “Antipredator defense as a limited resource: unequal predation risk in broods of an insect with maternal care.” Behavioral Ecology, Volume 13, Issue 1, 1 January 2002, Pages 125–133. I think they are sensors of a sort. Hi Piotr. My name is Dawn Flynn. 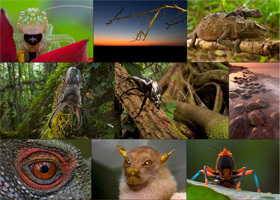 I am a treehopper systematist and taxonomist. Last year I published a review of the treehopper genus Umbelligerus. Your Costa Rican Umbelligerus is Umbelligerus woldai. Thank you for the ID, Dawn! Although not specific to this post, I was wondering how you avoid getting stung/bitten/injured when running after a creature you don’t know. Much like the spider story when it was dark and you heard movement from what you thought was a small mammal and took off after it, how did you know you weren’t running into something quite dangerous? Ian – The fact is that most of nature is not so dangerous as we imagine, and most animals are scared of us. A little avoidance, caution and knowledge go a long way. Chemically well-defended plants are more likely to do us damage, since they cannot run away from our blundering footsteps or grasping hands. Thank you James, I really assumed the guys in the field were in an inherently risky field. wow !!! these pictures are IMPRESSIVE !!!! Danke für Deine großartigen Beobachtungen. Respekt ! I love these articles and pictures of tiny creatures that are all around us but we may not see. I live in Tennessee, USA……….and we have leaf hoppers but the ones I have observed are not as exotic as most of these. I have seen green ones that look like thorns. I like observing them. How about parasites? Large horns could prevent a parasitic wasp from getting into position. That would be especially effective against wasps that target the brain. I thought the paper suggesting that treehoppers’ helmet was homologous to wings was negatively criticized. Do you know these papers, refuting some of it conclusions? I wonder where does it stand now? Yoshizawa, K. (2012). The treehopper’s helmet is not homologous with wings (Hemiptera: Membracidae). Systematic Entomology, 37(1), 2-6. 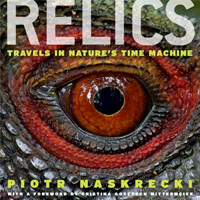 Mikó, I., Friedrich, F., Yoder, M. J., Hines, H. M., Deitz, L. L., Bertone, M. A., … & Deans, A. R. (2012). On dorsal prothoracic appendages in treehoppers (Hemiptera: Membracidae) and the nature of morphological evidence. PloS one, 7(1), e30137. Yes, I have seen these papers, but I find the wing theory really compelling. Maybe the “headgear” is supposed to make the insect appear as if it’s the victim of a fungus and therefore unpalatable? Seeing as these insects spend a lot of time motionless sucking plant juices, I could imagine that the spiny horns on the Umbelligerus sp. would look like the fruiting body of a fungus that has killed the hopper to a predator who come across it.. Very interesting idea! Not sure predators are keen enough to react to that signal, but that could/should be researched!